Designed for Pools Up to 50 feet in Length Of Any Surface! Complete Pool Cleaning at the Touch of a Button! Aquabot Turbo utilizes state-of-the-art microprocessor technology in cooperation with a multitude of sensors to completely clean pools as large as 50' long, regardless of their surface type, in a mere 4 hours or less. 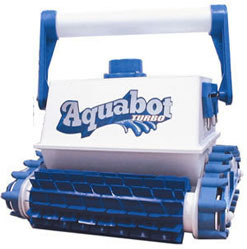 No wonder Aquabot Turbo is the world’s #1 selling robotic pool cleaner. Designed with you in mind, Aquabot Turbo offers you the convenience of complete pool cleaning ? floor to waterline and everywhere in between ? at the mere touch of a button. Aquabot Turbo cuts your total pool maintenance bills (chlorine, electricity, water, etc.) by up to 50%, and helps your wallet further, and the environment, by saving thousands of gallons of chlorinated water through the reduction of evaporation and main pool filter cleanings as much as 80%. Having its own built-in motors and filtration system Aquabot Turbo operates completely independent of the pool's filtration system, eliminating the need for sloppy, tangling hoses and costly to operate booster pumps, as well as decreasing pool filter usage and wear up to 60%. Simply plug it in, drop it in and press a button. The days of $100 yearly pool cleaner repairs are over as Aquabot Turbo is engineered for reliable, worry-free operation, having less than 10 moving parts and cannot become stuck on stairs or ladders. Here’s what else you get with Aquabot Turbo. Leading Quality Assurance & Engineering - Aqua Products is the world’s largest and leading manufacturer of robotic swimming pool cleaners. Operating in nearly 40 countries with 3 separate in-house research and development teams, Aqua Products employs the highest quality assurance manufacturing and design processes to ensure the best engineered products. From separate internal motor casing for lower long term repair costs to using brushless DC motors for limitless operating hours without failure to using drive belts that reduce drive motor load for lower wear, Aquabot Turbo is engineered specifically for the harsh conditions incurred within the swimming pool environment. 6,500 Sq. Ft / Hr. Yes, adjustable timer allows for customized cleaning cycles up to 7 hours or can operate automatically with auto-control pool equipment. 17.5" x 17.5" x 19.5"